On a night meant to celebrate the senior class of Boulder City High School, it was Moapa Valley who was celebrating as the Pirates routed the Eagles 63-14. 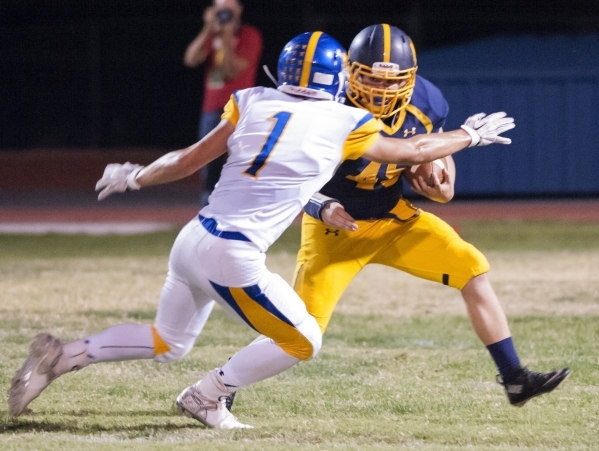 The game got out of hand early, as Moapa Valley hurt Boulder City (1-7, 0-5 Sunrise League) through the air and on the ground, with quarterback Nate Cox tossing two touchdowns and running back Sterling Simmons rushing for three more. The Pirates (7-1, 5-0) scored early, taking the lead on a Simmons rushing touchdown from three yards out. He would finish the game with 104 yards on the ground. Cox then found Derek Cope for a 35-yard touchdown to increase the lead to 16-0. Cox ended up 9-for-11 for 168 yards and two scores. There was a scary moment in the second quarter, as senior quarterback Austin Wishard — who also plays cornerback — went down with a left shoulder injury while trying to make a tackle. Wishard returned to the field after halftime without his pads and would not return to the game. Head coach Chris Morelli didn’t know the severity of Wishard’s injury. There were a few bright spots for Boulder City, however, despite the disparaging score. Junior quarterback Michael Martinelli took over for Wishard in the second half and, after throwing an interception on his first pass attempt, led the Eagles to their two touchdowns late in the game, both of which went to senior wide receiver Zac Murphy. Martinelli would finish the game 3-for-5 for 70 yards and two touchdowns. Senior defensive end-turned-running back Devin Reese continued to shine bright in the running game for Boulder City. After missing last week’s game, Reese had 86 all-purpose yards, including 55 of them on kick returns. The 49-point loss was a microcosm of the Eagles’ entire season, playing undermanned and outsized. Morelli said the team had to pull up eight players from junior varsity just so they could have a full roster for Friday’s game. Morelli will get a good look at those young players for the rest of this season and all of next, as Boulder City had more than a dozen players celebrating senior night. The team will play one final game together Friday, as the Eagles travel to Mesquite to face off against Virgin Valley to conclude a tough season.